IRVINE, Calif., September 19, 2018 – A central Orange County location, short commutes to work, and an endless list of places at which to shop, dine and play are just some of the perks of living in Irvine’s central business district. But for the soon-to-be residents of LUX, urban boutique townhomes in Uptown Irvine by Intracorp, there’s one benefit at the head of the class. Located within the prestigious Irvine Unified School District, LUX’s youngest residents will attend award-winning, California Distinguished Schools in the area including Culverdale Elementary, Westpark Elementary, South Lake Middle School and University High School. Crucially, LUX residents will pay no Mello Roos and will benefit from low tax rates and HOA fees. “It’s rare for homebuyers to find the right balance of vibrant, urban living and a safe, academically thriving community like Uptown Irvine delivers. LUX brings those elements together for families coupled with bright, spacious, thoughtfully designed homes they can grow into and enjoy in every season for life,” stated Intracorp Vice President of Development, Rick Puffer. 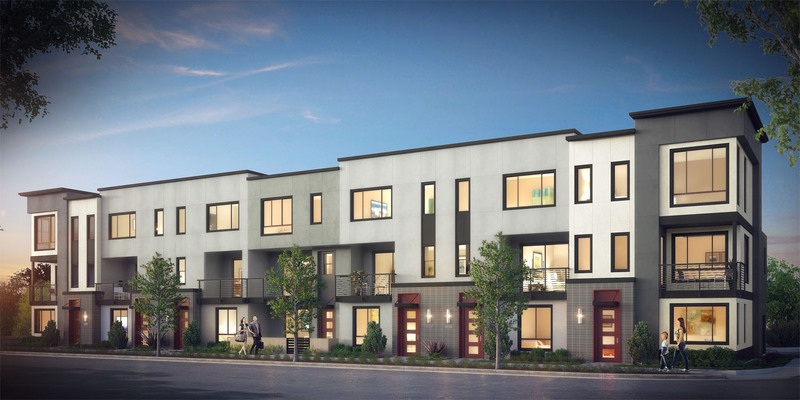 Offered from the high $800,000s, LUX’s 39 three-story contemporary townhomes feature large open floor plans up to 2,077 sq. ft. with three to four bedrooms and attached two-car garages. Select homesites include private entry courtyards, spacious decks for indoor/outdoor entertaining and a convenient first-floor bedroom with en-suite bath. Master bedroom suites have large, well-placed windows to maximize natural light and expansive walk-in closets. Energy-efficient kitchens outfitted with stainless steel KitchenAid appliances, Moen faucets, quartz countertops and white Shaker-style cabinets make up the hub of home. Kids and parents alike will appreciate the community park with built-in barbeques, dining tables, shade trellis and open turf area. Minutes from the Irvine Business Complex, LUX is close to the area’s hundreds of corporate HQs and startups such as Google, Houzz and Edwards Lifesciences, not to mention commuting hubs such as Irvine and Tustin Metrolink stations and John Wayne Airport. Nearby, family-friendly dining, shopping and entertainment venues include The District, Diamond Jamboree, Park Place, South Coast Plaza, Segerstrom Center for the Arts, Newport Beach and Laguna Beach. Located at 17821 Gillette Ave, Irvine, CA 92614, LUX will debut November 2018. Intracorp invites interested buyers to visit LUXirvine.com, where they can join the interest list to be notified about Grand Opening activities, anticipated in November. Developing communities in six urban regions in North America, Intracorp has established itself as a real estate developer that delivers extraordinary experiences to homeowners. As one of North America’s largest developers of multi-family homes, Intracorp has delivered more than twenty-two thousand homes in 176 communities. The company grew out of founder Joe Houssian’s first business venture, Intrawest, which was founded in 1976. It began as an urban residential real estate business and transformed into an internationally renowned resort and real estate development company credited with the success of several preeminent ski resorts such as Whistler Blackcomb. Intracorp currently develops outstanding communities in British Columbia, Ontario, Washington State and California. LUX is part of the company’s collection of residential for-sale developments in Uptown Irvine. Its neighboring properties include C2E (C2EIrvine.com), a now-selling community of 71 urban boutique townhomes, and MDL, a modern, amenity-rich community of 137 townhomes coming in early 2019.